100m long weir in wonderful valley of the Avon. Meadow, old ferry crossing steps, long deep water stretches. Shallow paddling areas above weir, play areas under weir near bank. Water generally clean despite Environment Agency rating. Popular. Follow A36 out of Bath (or cut across via university campus). 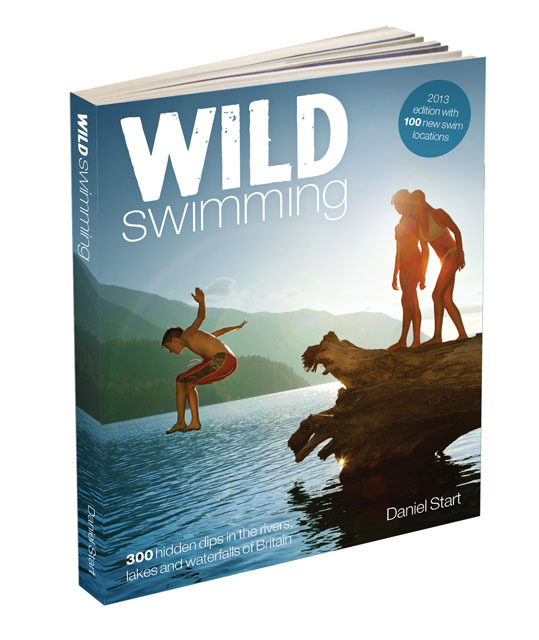 Place Categories: River Swims and Wild Swim.Place Tags: dive, paddle, swim and wildswimming. BEWARE .Parking tickets will be on your car if you park in the gravel layby on the left handside over the canal bridge.Tho there is no notice this is a passing layby.Great spot to cool down , please keep it pretty take your rubbish home. One of the most perfect swimming places has been destroyed by mindless ranks who strew and dump their rubbish all over the beautiful field and leave rusty wire barbeque grids for the indigenous cattle to injure themselves on. I’ve tried carrying round black sacks, I’ve tried asking people to take their litter away. What should be a little paradise is now a dump and makes me so angry that, sadly, I don’t go there any more. I wish I could. I’m coming to bathampton next week and love wild swimming. I won’t have transport apart from my bike and I don’t do hills! Where would be easy for me to get to, and is anyone swimming then to keep me company? Does anybody know if there are any good camping spots near by? Beautiful Warleigh weir. Many happy memories. Particularly remember my lovely boy over twenty years ago squeezing my hand with excitement and saying ‘ Mummy we are so lucky for Warleigh Weir’. We were so lucky and so is anyone who finds this lovely spot. Treasure it so in 20 years time you will have such lovely memories. Is there toilets anywhere nearby? Really good fun, swam fully dressed!! Due to a trade chemical having entered the sewage works at Thingley, a large volume of sewage has unfortunately been released into the Byde Mill Brook and subsequently the River Avon. Work is ongoing to stop anymore sewage being released and it should be stopped within the next few days. However, there has already been a significant impact on the water quality along this stretch of river and part of the River Avon. Some fish have been seen dead in the river, and there may be a sewage in the river and a strong odour from the area and watercourse for up to a week. There is obviously an issue for environmental health due to smells, potential flies etc, and water quality in case any person were to enter the river. Please be assured that the Environment Agency have been and will continue to monitor the river quality and will be taking further action depending on how the situation progresses. If you have any events planned over the next week near to the watercourse or are aware of key locations where public may be close/ swim in the river you may want to make them aware. Visited on a hot Sunday evening on 21 July 2013. There were at least a hundred people there and judging by the compressed grass on the verge of the main road there had been several hundred more earlier. Interestingly, as if by some unconscious act of self-censorship the losers had separated themselves from the winners by gathering in the field to the North of the weir. A nervous gaggle of catalogue reject boys, lead by an alpha who clutches a boom box, umbilically connected to an iPhone in his pocket, seemingly only loaded with Skrillex or maybe the cracked screen prevented him from selecting anything else. I would describe them as neanderthals if I had any confidence of their ability to hunt or gather in the absence of a Tesco Express. Yelling, just so their vacuous prattle could be heard, each sentence both introduced and punctuated with a swear word. They sit in circles and take shifts operating the drug paraphernalia, evicting plooms of grey bong spoke over a foundation of sweet wrappers. In contrast, the actual water was tranquil with about 20 or so polite individuals splashing around. 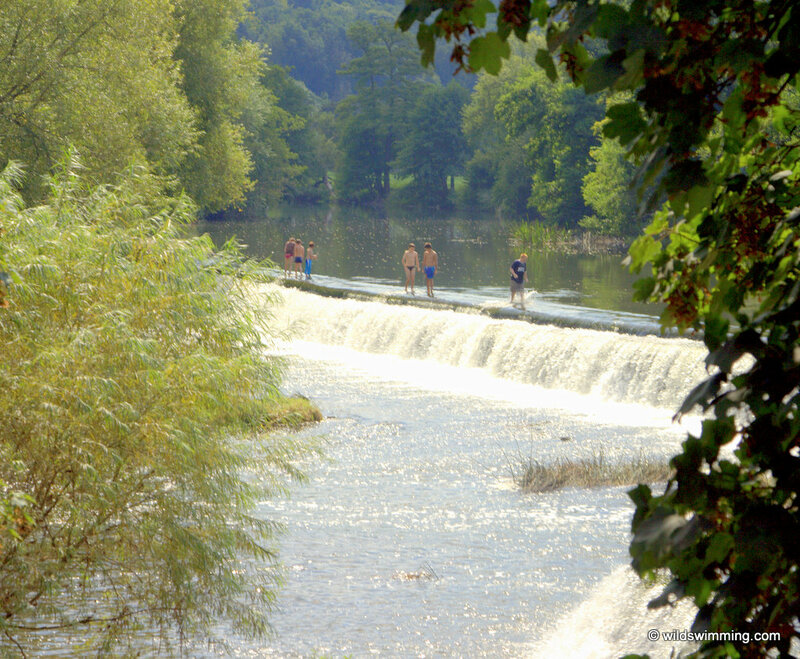 The steps of the weir are carpeted with a cushiony layer of plants which allow enough purchase under foot to lay flat against the waterfall and let the weight of the water massage your shoulders. Swim further upstream and it’s even quieter, now a wide gentle flow bordered with trees, the glassy smooth surface occasionally interrupted by the joyous sound of a fully grown man swinging from a branch and plunging feet first. So in summary, if you want to ensure that your child’s only exposure to drug abuse is through Alice in Wonderland and their sweet innocent ears don’t hear language that would make a Glasgow docker sound like Little Lord Fauntleroy then don’t take them to Claverton Weir during a heat wave, or at least if you do, cover their ears and eyes until you get to the actual water. Is there parking near here? i cant find any reference to some. Thanks. Not really. There is no safe parking in the vicinity. The dead-end road (Ferry Lane) that leads to the site is strictly no parking and you’ll end up parking along the busy and dangerous A36 (Warminster Road). However, there is a good bus service and you can cycle along the Kennet and Avon canal. This was once our little secret as kids. It’s still great but can be rammed. Cows graze around you too! The land is owned by one of the most tolerant farmers ever, given the amount of losers who leave their litter behind. Please don’t be one of them! Great spot, really deep, river was a bit fast floowing when we were there but plently of places to get in and out. Looks great… will check it out soon. Any info on wild swimming spots, lidos, pools between Reading and Bristol appreciated. Planning a cycle/camping trip v soon. A pretty 100m stretch of river running alongside church lawns between old bridge and weir. 4/5 based on 5 user reviews.